When I was a little girl, I never imagined I’d one day be a dumpster diver. Well, I have no shame in this fact, my friends, especially when I end up with diamond-in-the-rough results like today’s featured treasure finds. It doesn’t hurt that the “junk” is free, and that I’m doing my community a favor by keeping perfectly good furniture, outdoor accents and building supplies out of our landfills. Give it a try in your neighborhood. When you’re actually on the hunt, it’s amazing what you can find. One tip: if there is no “free” or “take me” sign, or if it’s not inside a trash bin, be sure to ask permission to take the item from your neighbor – they may be donating it or may have forgotten and left it on the curb. Any which way, if you’re lucky enough to discover a curbside piece of “junk”, see what you can make of it. For inspiration, take a look at these dumpster diving “befores” and “afters”…if I say so myself, they make quite a splash! I asked my neighbor if it was okay to take this crate she had just left on the curb for that morning’s trash pick-up. She was more than happy to see it go to good use. 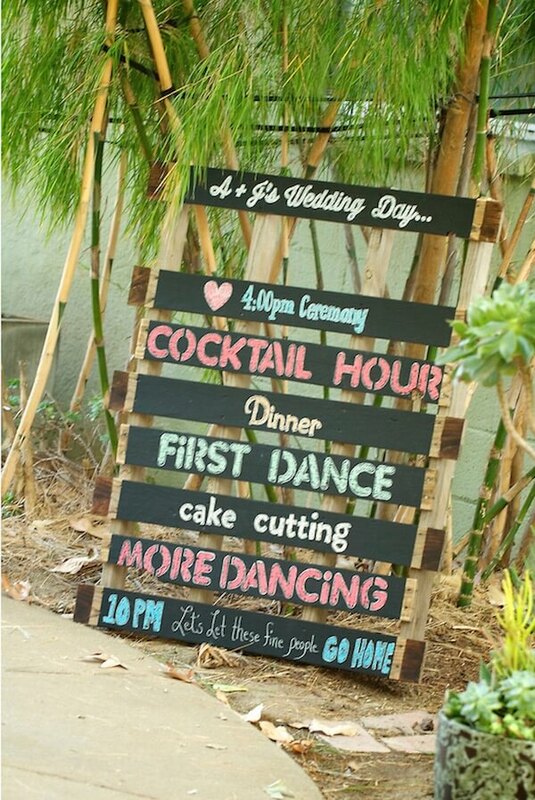 Repurposed into a pallet wedding chalkboard sign! This was quite a fun project, turning this soon-to-be trashed pallet into a wonderful, wedding decor memory for my brother- and sister-in-law. I especially enjoyed adding the stained edges to this chalkboard sign wow it up a bit…the individualized fonts add whimsy and character, don’tcha think? 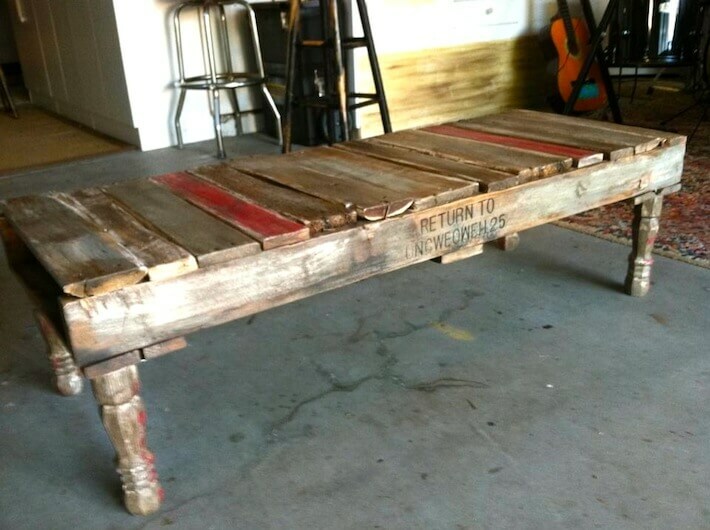 Repurposed into a pallet coffee table! Skillfully hand-made by HomeJelly contributor, Bridget Johnson, this wonderful crate coffee table now proudly serves a second purpose. Jump on over to her “RepurPoshed” pallet coffee table post for the full how-to. By the way, here is a great article on how to tell if wood pallets are safe. Whenever I see something that can be deconstructed and used as building material, it excites me. This fence broken down into a pile of wood can then be transformed into a picture frame, fun artwork, a sign, or simply painted and hung as is. The ideas are endless! American flag made from upcycled fence. It’s always fun to notice details in my neighborhood, like this American flag made from old fencing. It also gives me the warm-fuzzies when something that could have landed in the trash ends up in such a noble form. USA indeed. I found these on a walk with Klunkers. I called my husband, Matt to come pick us all up. Lucky thing I sat on them while we waited…the neighborhood “sharks” were circling, and I almost lost them to other fellow dumpster divers! I have to say, this is my proudest DIY achievement. I think Klunkers is equally delighted with our co-curbside find. See how I put my head and these weathered chairs together to make this super-duper bench. I know! Who would simply throw one of these beauties away? They sell at antique stores for at least $25-$45. I’m not quite sure what this will be, but I do know it’s going to be the center of attention at this year’s Thanksgiving table. I think I might fill it with flowers or tip it upside down and use it as an elevated pie plate. Decisions, decisions! Scrap Reclaimed wood wine rack! DIY reclaimed wood wine rack! Matt recently visited a friend of ours who made this beauty above out of scrap, er…we’ll call it “reclaimed” wood. (*wink*) This is a beginner wood-maker level project. It is held together with 1″ x 4″ planks screwed into the back of this beautiful, reclaimed wood, then strategically placed and hammered in 8″-10″ black concrete nails. It all come together to create this rustic wine rack. Cheers! Again…what?!? Terra cotta pots like these, would range from $35 – $100 per pot! What a find! I knew I had to take ’em, but, I’m still scratching my head as to how I’d like to transform them. I loved this project below…I could do a version of this again. Hmm…what to do, what to do? Home sweet home stacked planters! This project was so much fun and I look forward to upcycling the ones above into something equally as fabulous. Check out the full stacked planters how-to and make one yourself! Personalized Pot for the Hip(ster)! Finished hip(ster) pot looks modern and personalized. Updated pot: Our front steps now have a new, modern and hip pot to greet guests. Again, dumpster diving and curbside procuring is fun, exciting, and worth it! Come on, and give it a try! What curbside find have you found in your neighborhood?